Alejandro González Iñárritu's stunning and brutal The Revenant poses and answers the question audiences have pondered since Jack Dawson followed the bulk of the Titanic and sank deep into the North Atlantic: How much agony can Leonardo DiCaprio take? So much. SO. MUCH. In the American wilderness of 1823, a ravaged-looking DiCaprio stars as Hugh Glass, a navigator for a company of burly and desperate fur trappers lead by their loyal captain Domhnall Gleeson. After a savage attack by the local Native American tribe, who are hunting for their chief's daughter "stolen by two white men," Gleeson's company is decimated, the handful of survivors left to their own devices in the wilderness. 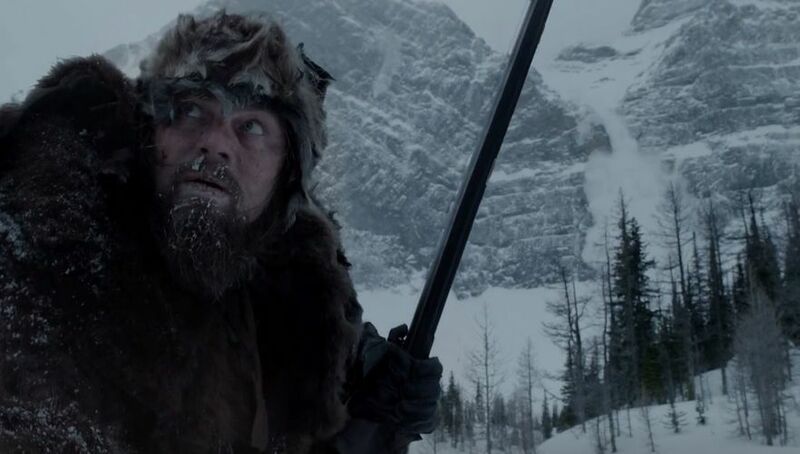 Then, while scouting a safe passage through the woods, a grizzly bear kicks the ever-loving hell out of DiCaprio. Leonardo DiCaprio vs. the grizzly bear is probably the most visceral and shocking movie encounter of 2015. Iñárritu puts us at ground-eye level with DiCaprio as the bear mauls him, rips his flesh, mounts him and pounds him into submission in one ghastly, unbroken shot. That DiCaprio manages to kill the bear with his Bowie knife is pretty astounding, though when they tumble off a cliff and the hundreds of pounds of dead bear land on top of him, one must ponder how DiCaprio possibly could have survived. Gleeson and company find DiCaprio, who is all but a corpse, and try to save him but trying to keep him alive and transport DiCaprio to safety across the hostile wilderness proves all but impossible. Taking the company forward, Gleeson leaves DiCaprio and his half-Indian son in the care of Tom Hardy, a scheming, opportunistic sleazebag (literally - the remaining hair on his once-scalped dome is riddled with fleas). Hardy soon becomes the bane of DiCaprio's existence when he decides to abandon DiCaprio, murders DiCaprio's son, and trundles off to fend for himself. Instead of joining his son and his Native American wife in the sweet, warm, welcome embrace of death, DiCaprio is reborn as The Revenant. Willing his broken body onward, step by step, with a lot of sleeping in snowy caves to help himself recover, The Revenant forces himself on a harrowing, seemingly impossible journey to find and exact revenge on Hardy. Clad in the bear skin of his vanquished foe, The Revenant encounters more Native Americans, one of whom becomes a friend who tends to his festering wounds and shelters him in a makeshift teepee in a blizzard, and more rotten Europeans, like a cadre of scummy French fur trappers in possession of the Native American girl who was kidnapped. All the while, The Revenant is haunted by the spirit of his dead wife, reminding him of a parable about the sturdiness of a tree's trunk in comparison to its branches swaying in a storm and leading him to a giant teepee of skulls. What does it all mean? The Revenant doesn't say. Or maybe The Revenant doesn't know. What we do know is: it's hard out there for The Revenant. In his quest to finally capture that perpetually elusive Best Actor Oscar, DiCaprio willingly and heroically endures every terrible hardship Iñárritu dreams up to put him through. Iñárritu must also be a big fan of Star Wars because he peppers The Revenant with a couple of canny homages: After riding a stolen horse off a cliff to escape the French fur trappers out to kill him, The Revenant, who miraculously survived the plummet, hacks open his dead horse, pulls out its organs, and climbs inside it to spend the night, just like Han Solo did to Luke Skywalker's Tauntaun on Hoth. The Revenant also receives a vision from his wife's Force Ghost; though after what he went through with that bear, the last thing The Revenant probably wants is to party with a bunch of Ewoks. Not to mention Domhnall Gleeson plays the villainous Commander Hux in The Force Awakens. After what feels like an eternity to The Revenant and the audience, The Revenant finally finds his way back to the wilderness fort where Gleeson is, only to learn that Hardy, who heard The Revenant was alive and coming for him, skeedaddled with all of Gleeson's cash. So with hardly a moment to rest his scabbed-over, weary body, off into the wilderness again goes The Revenant and Gleeson, for a fateful, bloody, knife-swinging, finger-slicing final encounter with Hardy where The Revenant learns that revenge is not the right thing to do**, which feels weird after everything he went though. It felt weird when James Bond learned that same lesson at the end of SPECTRE too. Visually, The Revenant is truly spectacular. Shooting various parts of Canada and South America as a stand in for the early 19th century pre-developed United States, Iñárritu captures absolutely breathtaking imagery and some provocatively dreamy sequences, juxtaposed to the unrelenting, wanton brutality of nature and the ignoble acts committed by Native Americans and white men to each other. Iñárritu is also now Hollywood's foremost expert at getting his actors to do the most miserable things, like actually eat raw buffalo meat (when there are huge fires burning right next to them -- cook the meat, you savages) or getting Tom Hardy to dunk his head in a freezing river and play dead so Iñárritu can get the shot he needs. Where in America The Revenant takes place is a bit fuzzy. The Native American tribe is referred to as the Pawnee, so one can only conclude that The Revenant is set in Indiana and is a prequel to Parks and Recreation. Which must mean Leonardo DiCaprio plays Ron Swanson's great-great-great-great grandfather. If The Revenant actually survived the end of the movie, one hopes he gets to go to whatever early version of the Eagleton Mall exists and treats himself. ** DiCaprio looks right into the camera in the last shot of the movie. He should have said something like: "Don't do drugs" or "Stay in school." You know what else would have worked? Missing from #TheRevenant: @LeoDiCaprio introducing himself as The Revenant. "Who are you?" "I'm The Revenant." "What does that mean?"